Welcome to your complete guide to the best rabbit water bottles! If you’re a first-time bunny owner, then you may not know how important it is to select the appropriate water bottle. Choosing one that is too small or that leaks will leave your rabbit thirsty and her cage afloat. So it’s best to do your homework before settling on just any bottle. Fortunately, we’ve made your search easy! 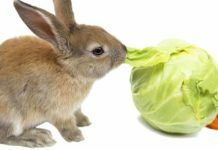 In this article, you’ll find the best leak-proof, chew-proof rabbit water bottles to keep your bunny hydrated and her cage dry! Why should I buy a bunny water bottle instead of a bowl? You may have heard that bunnies prefer to drink from bowls instead of rabbit water bottles. This may be true for some rabbits, usually because it’s easier for them to drink this way. But the truth is that water bottles are generally the best option for a number of reasons. For starters, rabbit water bottles can hold more water than bowls. This is pretty important if your bunny lives in a hutch outdoors, or if you have multiple bunnies. Secondly, water bowls can be easily tipped over. Even the heavier ones may be tipped by a particularly large bunny or group of bunnies. A bottle affixed to the side of the rabbit hutch solves this problem. Thirdly, your rabbit cannot soil the water inside a bottle. With an open bowl, though, it’s easy for her to kick shavings, food, or even her little bunny poo-poo into a water — which means she doesn’t have fresh water until you happen to notice her mess, possibly hours later. Now that we’ve established that rabbit water bottles are typically better than bowls, which bottles are the best choices? What’s the best rabbit water bottle? It should should easily affix to the hutch, with a sturdy holder that isn’t likely to collapse under stress. The bottle, especially the nozzle or sipper, should be made of chew- and scratch-proof material, such as a hard plastic compound like PVC. According to the Humane Society, if soft plastic is scratched, the resulting crevice may become a hiding place for bacteria and other nasty things. It should be easy to fill, easy to keep clean, and easy to check the water level. 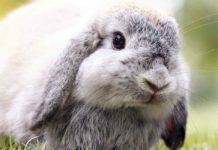 An adequate water supply should be supplied for your particular bunny’s breed and size, as well as the number of bunnies who will be using it, without the risk of it running dry during the day. In the following sections, we’ll present a few lovely rabbit water bottles which meet the above criteria. Many rabbit cage water bottles are standard plastic bottles with wire holders for easy hanging on your average rabbit hutch. Kordon Oasis (Novalek) Frosted All Weather Rabbit Water Bottle – This water bottle can be used in an indoor or outdoor rabbit hutch. The frosted plastic doesn’t allow as much sunlight through. This helps to keep algae growth inside the bottle to a minimum. You can still check the water level by looking for the floating turtle. This model is 12 inches tall and holds 32 ounces of water, which should be plenty for one rabbit. The sipper has a vacuum valve, and the holder allows you to hang it from the wire wall of the hutch. Ware Manufacturing Best Buy Water Bottle for Small Pets – Another 32-ounce plastic water bottle, but with a spring-loaded sipper. According to multiple consumer reviews, the spring-loaded sipper helps to prevent leaks, but makes it harder for some rabbits to get the water. You may need to be extra vigilant about checking this bottle daily to ensure that your bunny is quenching his thirst. Other reviewers suggested that this model’s hanger wasn’t super sturdy. This may be alleviated by hanging the bottle from the outside of the hutch, away from your rabbit’s reach. As many small-animal owners know, rabbit cage water bottle holders can be a nuisance. Kordon/Oasis (Novalek) Easy Top Rabbit/Ferret Water Bottle – Here is a bottle with an easy-to-fill top! Simply pull the top off, refill, and put it back on; no need to remove the bottle from its holder. And the holder is definitely not a flimsy one – the mounting bracket is screwed on to ensure a tight fit. Model comes with a ball-point sipper, which some consumer reviews suggest is too large for their dwarf bunnies, but works for larger breeds. This bottle can hold 12.5 ounces; this is less than half of the capacity of the 32-ounce bottles above, so you’ll probably need to fill it multiple times each day. Lixit Top Fill Water Tank – If you’re looking for a larger top-fill water bottle than the one we described above, then this model may work for you! With heavy-duty, UV-resistant plastic, this bottle can be used both inside and outside. The spring-loaded valve helps to prevent dripping, but don’t let the spring-load scare you. It appears that some reviewers have had better experiences with their rabbits getting water than others. It may just depend on what your rabbit it used to, and a little training might be necessary. The holder allows you to mount the bottle from a vertical or horizontal wire on the hutch. Rabbit water bottle leaking is never a good thing. A leaky bottle means that your bunny’s cage could end up flooded or partially flooded, leading to wasted bedding. But it also means that your bunny won’t have any water until you notice that their bottle is empty! Choco Nose Patented No Drip Rabbit Water Bottle – Unlike other no-drip water bottles, this one has a ballpoint sipper. This may be easier for some bunnies than the spring-loaded sippers. The mounting bracket allows the bottle to be nailed into a wall or screwed into place, giving you more locations from which to hang it. This model can only hold 11.2 ounces, which may be a nice option for a small or mini rabbit breed. It will need to be refilled at least twice daily for a medium or large-breed rabbit. SunGrow Pretty Purple Pet Water Dispenser Bottle – This water bottle seems to be a popular rival to the Choco brand, with many reviewers experiencing varying degrees of success with each brand. Like the Choco model, the SunGrow bottle has a chew-proof nozzle, screw-on bracket, and is small (only 10 ounces). So it will be best-suited for small bunnies or in instances when the bottle can be checked and refilled multiple times daily. One thing to note about rabbit water bottles and leaking – leaking may very well be due to the bottle not being assembled properly. For best results, be sure to read the manufacturer’s directions for assembly and installation. Are you having issues with the nozzle on your current water bottle leaking? Is your bunny having problems learning how to get water from the nozzle? Then you might consider buying a different type to try with your existing bottle. 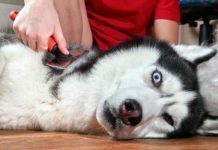 Having extra nozzles could also be handy, in case your furry friend chews on it or the cap. The Yosoo Pet Water Bottle Nozzle is a rust-proof, stainless steel nozzle which has a ballpoint sipper. You can buy them in packs of one or three. They look to be very similar, if not identical to, the nozzles on the no-drip rabbit water bottles we described in the previous section. If you have a large-breed rabbit or multiple rabbits, then a water bottle that is large enough to accommodate them is a must-have. Do not purchase a large water bottle if your bunny or bunnies won’t be emptying it every few days, though; water that sits in a bottle for longer than that may become a bit “stale,” and besides, fresh water is the best for your critters! Lixit Corporation All Weather Rabbit Water Bottle – This all-weather bottle can hold a whopping 64 ounces (e.g., half gallon) of water at once! Several consumer reviews indicate that it’s a 50-50 chance that the ballpoint sipper will leak; however, the manufacturer has very clear directions for assembly to prevent leaking, so the complaints could be possibly due to operator error. This model is showing as temporarily out of stock on Amazon, but you may be able to locate it at another retailer until it becomes available again. Miller Manufacturing BB64 Bunny Drinking Bottle – Here is another 64-ounce, all-weather water bottle. It’s essentially the same as the Lixit brand described above. One thing to note about these larger rabbit water bottles is that they are harder to attach securely to the cage, according to some customer reviews. If your rabbit lives outside in an area which experiences temperatures below freezing pretty frequently, then a heated bunny water bottle could ensure that she has access to non-frozen water at all times. The Farm Innovators Model HRB-20 Heated Water Bottle for Rabbits keeps up to 32 ounces of water (and the sipper) from freezing, even in subzero temperatures! Clips are included for easy installation on your outdoor rabbit hutch. One drawback is the short length of the cord, which is only 18 inches long, so you may need to plug it into an extension cord in order to reach the closest outlet. Some pet owners have searched for insulated rabbit water bottles, but the market seems to be very sparse. Only one is available on Amazon, and we are unable to fully recommend it as there aren’t yet any user reviews. When it comes to rabbit water bottles, one size does not fit all – quite literally. Rabbit water bottles range from simple plastic bottles (either clear or frosted to filter sunlight) in various sizes, to fancier top-loading, anti-drip, and even heated models. 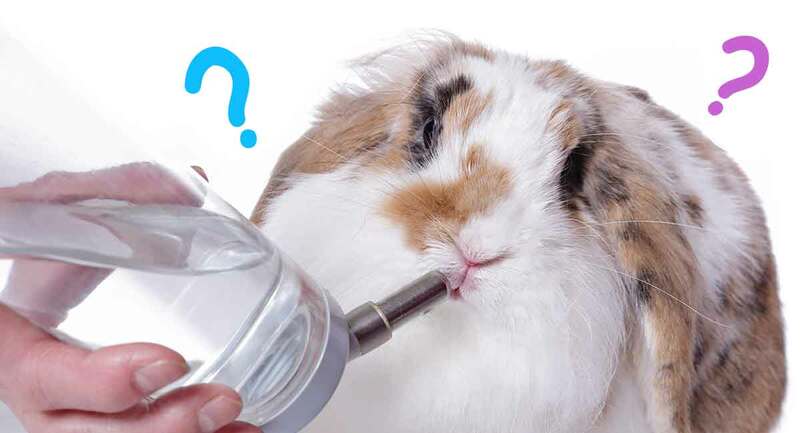 Before you select a rabbit water bottle and sipper combination, carefully consider how much water will be needed to keep your bunny or bunnies hydrated for a day. Be sure to buy a rabbit-specific water bottle, as those which are meant for smaller or larger animals will not work well for bunnies. And finally, be sure to select a model that your bunny can’t gnaw on, scratch, or otherwise damage.